We saw this plant in Tasmania recently. It also comes with markings on the leaves. Hi Marilyn, It may be difficult to identify from just leaves. Flowers would help. Could it be a Heuchera or a Ligularia? A browse through a perennial nursery catalogue may give some clues. I"m assured this is a Podophyllum. If anyone knows where I can buy one, especially "Spotty Dotty", please let me know! 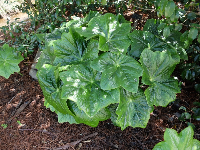 I just bought a Podophyllum Spotty Dotty from Antique Perennials at the 2015 Collectors Plant Fair, So I"m thrilled to find it in mainland Australia. Comment on "Plant ID please"